Recently, I was tinkering with ways of creating the illusion of depth for mapping water. The gist is that you can use increasing opacity in deeper areas to get the effect of diffused light and reduced visibility. Like in real life. But there is no reason you have to go restricting your shenanigans to ocean environments. The same thing happens in the atmosphere when there’s an inversion. Fog. Nice, beautiful, misty, opaque fog. 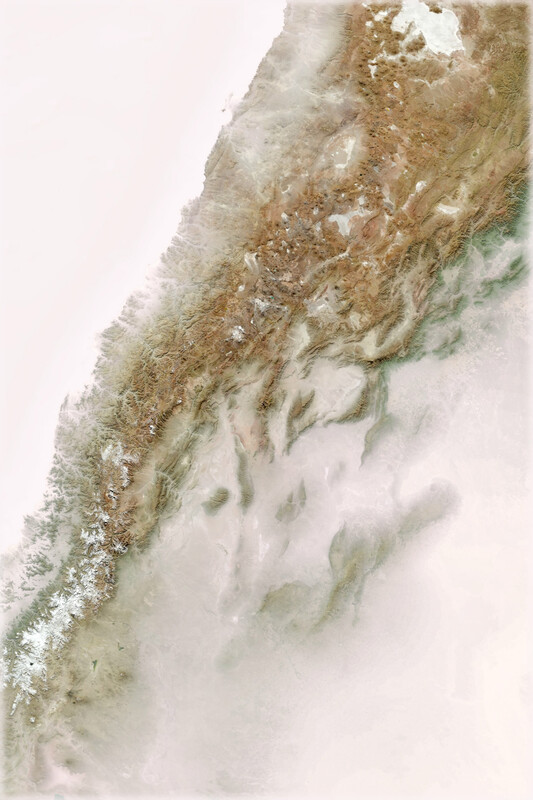 Here is a look at the Chilean Andes and Pampas region of Argentina, shrouded in mist. 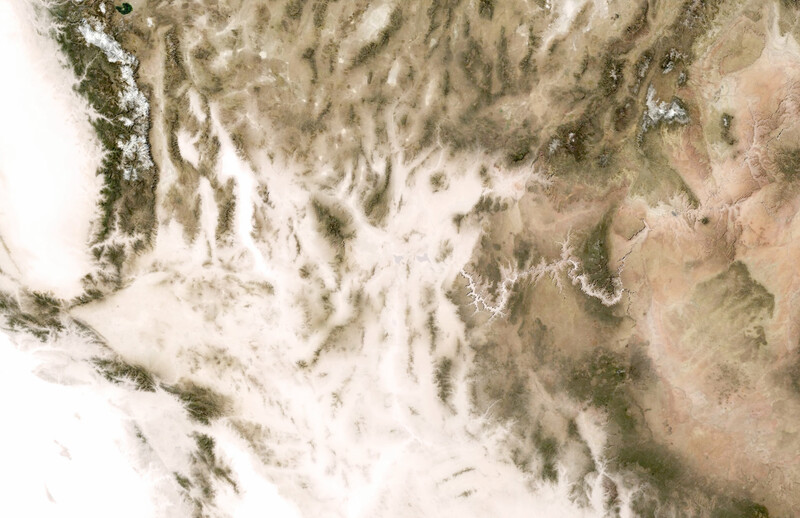 This is a look at the Southwest United States. The Imperial Valley of California is filled with fog, spilling over into the contours of Southern Nevada and filling in the Grand Canyon. 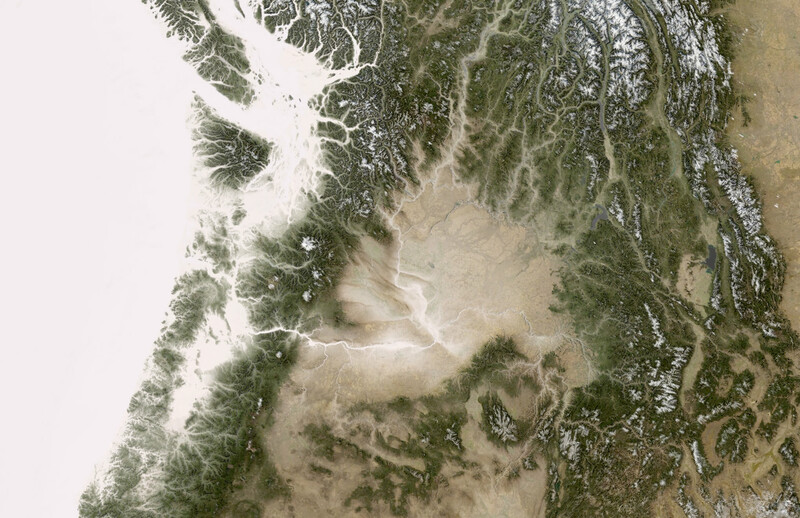 The Pacific Northwest rises quickly from the mist which then pours down into the inland basin. 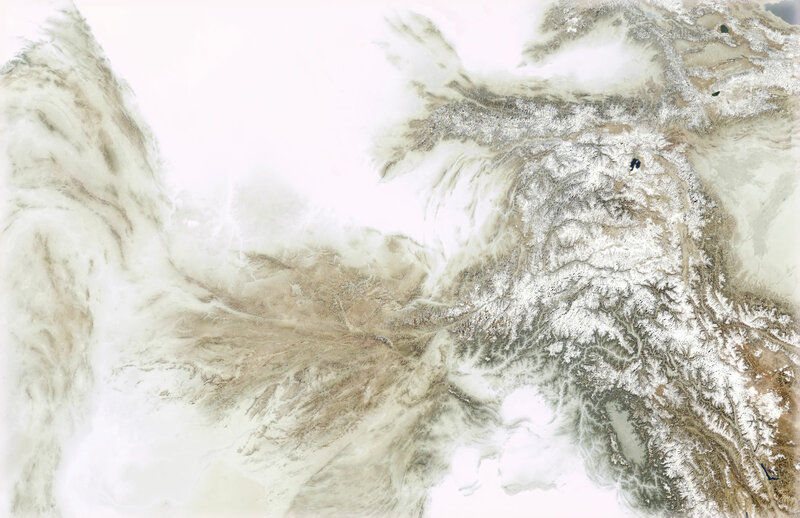 And here is a look at the western spine of the Himalayas sinking into the foggy Afghan uplands. How do you make these? It’s the simplest thing. You just give a Digital Elevation model a color gradient from opaque to transparent and draw it on top of a satellite image. Yes, that’s it! Here are some more nitty gritty details if you are into that sort of thing. This is a satellite image of the region around the Gulf of Aden from NASA. And this is a digital elevation model (DEM) of the same area (also from NASA). If you’ve never played with DEM data, it’s an image where the brightness of pixels represents elevation (not altitude -don’t get my dad started on this). Generally, a DEM is a black and white image were dark pixels are the lowest elevation places in the image right up to the white pixels which are the highest elevation. Cartographers and GISians do all sorts of amazing things with DEMs, like use them to render hillshade effects, calculate steepness, draw lines of sight, and do bonkers simulated water flow stuff. But mainly hillshade. I like to while away bits of my allotted time on this earth just applying different color schemes to DEMs, because I think they are ghostly and beautiful on their own and I like to look at them. I feel I must. Then this tweet got me to thinking, hey, I can use these things on top of satellite imagery and make a fog effect. My single favorite feature of ArcGIS Pro is the addition of the alpha channel in setting item colors and color ranges. The default color range is this trusty old black to white gradient. And here is the gradient I applied to get the red-hot lava looking version up there. But here is a gradient that I made to replicate mist. See the transparency? Wait, why isn’t it white? It looks like it goes from a tinge of crimson over to faint cyan. Why add faint hues to the mist color gradient? Because of Bob Ross. As a shy, pasty, awkward kid whose hair stood on end because of asthma medication, I watched PBS with reverence as Bob Ross, who had hair that stuck out like me, plucked whole worlds right out of his gentle mind’s eye and applied them to canvas -and he wanted me to do the same thing. I noticed he would always add a tinge of trusty alizarin crimson to the otherwise titanium white of his clouds. Clouds aren’t really white he would say. Brush up on the atmospheric effects on sunlight if you want to impress kids and steal the thunder of any remote sensing specialist in the vicinity. 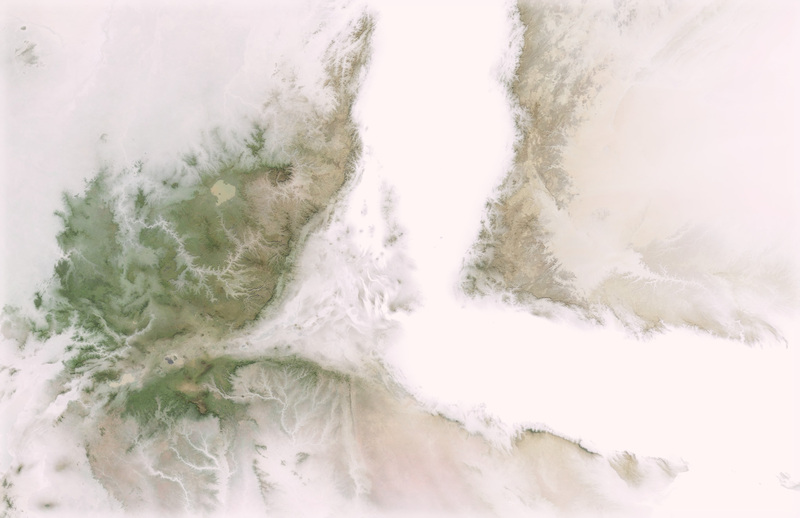 Anyway, when you use a gradient like this, on top of a satellite image, the effect is a misty cloud bank clinging to the lowlands while higher elevations break through. Fun. Useful? I don’t know. Useful for fun? Yes. Here’s a jumpy animation of Norway getting enveloped in a fog bank. Shadows. Ken Field suggested that I turn the mist effect up to eleven by adding an extreme hillshade layer, shaded in a dappled sunlight color, to create the illusion of tall objects casting shadows through the fog. I love this idea. My first attempts at this effect have failed, but I’ll keep trying. Labeling. I am going to look into rendering labels beneath the mist layer to further the effect of an ephemeral text layer dipping above and below a fog bank. Tilt Shift. I am going to try using a DEM image as an opacity mask for the making of fake Gigantic Miniatures, or Tilt Shift images. They rule, and I think a DEM might be helpful in establishing a true focal range to miniaturize a downward-looking satellite image. Anyway, I hope you try it this misty mapping out. Like Bob hoped that I would try out painting. I started painting as a hobby when I was little. I didn’t know I had any talent. I believe talent is just a pursued interest. Anybody can do what I do. -Bob Ross. Nice post, thanks. Bob Ross references = perfect. This is fantastic! What clever way to display terrain. Thanks! Watch out, it’s pretty addictive though.